As model driven development is emerging, OutSystems has become one of the leading low-code development platforms for developing both web and mobile applications. Model driven, or low-code development platforms such as OutSystems have one major advantage over their full-code cousins: rapid application development and full control over the application life cycle. One thing must be kept in mind though: the delicate relationship between speed and quality. Building applications rapidly may result in applications that are of poorer quality. Even though low-code platforms such as OutSystems are closing the gap between IT and business, creating future-proof applications remains key when aiming for reaching maximum potential of these platforms. Fortunately, OutSystems customers are realizing this exact point as well and they have been increasingly asking for governance on their software development processes. They are looking for answers to questions such as: How has the maintainability changed since last sprint? How does the code quality and productivity of my scrum teams differ? How can I reduce my maintenance costs? To what extent are components re-used? In order to meet customer’s wishes and help them to reach the full potential that low-code platforms have to offer, Transfer Solutions and Omnext have joined forces to realize an automated quality scan for OutSystems. Omnext has been specializing in analysing software applications for over 15 years and its technology, the Omnext Fit Test, is thus far already supporting over 30 different languages more modern ones such as Java, C# and SQL, but also legacy languages such as RPG and COBOL. Together with both Transfer Solutions and OutSystems, quality rules were defined, based on the ISO-25010 guideline for software maintainability and guidelines on software quality, supplemented with OutSystems-specific best practices. The importance of these rules is adjustable and customers are able to add their own rules, hence enabling them to gain insight in the exact elements of an application that are of key interest to them. The results as presented in the dashboard enable the customer to identify areas for improvements and if required, Transfer Solutions can offer its expertise in the form of Expert Reviews to really help customers take the next step in improving the quality of their applications. The Fit Test 4 OutSystems can be executed as a single scan, but also as a repetitive cycle which allows customers to analyse their applications on a frequent basis. Especially in a continuous delivery context, having continuous insight in the quality and development of your application proves to be of great added value. To further support this in the future, Omnext, together with OutSystems is already exploring the possibility of using an API to automatically transfer the application sources to Omnext and have them analysed on the fly. 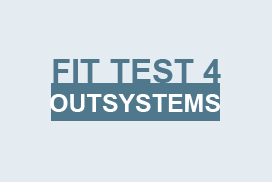 We believe that the Fit Test 4 OutSystems is a perfect addition to the OutSystems Platform. With it we ensure that our customers can deliver high quality OutSystems applications now and in the future. If there are any questions in response to this blog post. Feel free to contact Omnext or Transfer Solutions.